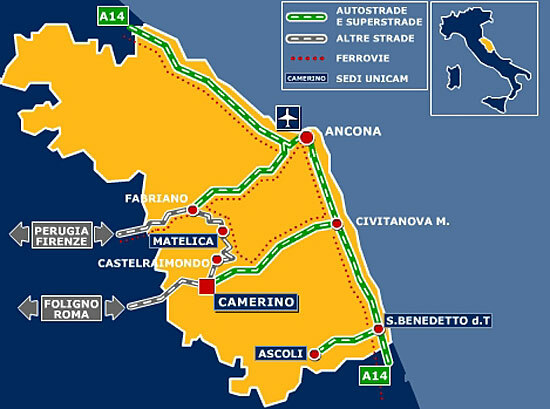 Those traveling on the A14 motorway should leave at “Macerata-Civitanova Marche” and proceed west along the highway till its end. Then, drive for about 10Km to the top of the hill where Camerino is located. Those traveling on the west side of “Appennini” mountains should reach Foligno, and then use the SS77 which will leads, after about 60Km, to the highway junction. From here, drive for about 10Km to the top of the hill where Camerino is located. from Rome: Coaches depart daily (except sunday) from Rome Piazzale Tiburtino 7:20 am (2:40 pm) and arrive at Camerino 11:40 am (7:00 pm). Coaches leave daily (except sunday) Camerino at 6:00 am (15:35 pm) and arrive to Rome Piazzale Tiburtino at 10:20 am (20:15 pm). A shuttle train connects Rome-Tiburtina station with Rome-Fiumicino “Leonardo da Vinci” airport ever half an hour. The railway station “Camerino-Castelraimondo” is a minor station. It is only connected to a greater station, Fabriano, located along the route Ancona/Rome. There is a regular bus service connecting the “Camerino-Castelraimondo” station with the city center. Camerino is one of the most beautiful little towns of Central Italy, being its medieval historical center one of the oldest in Region Marche. 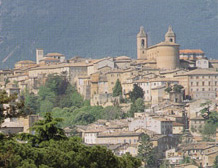 Camerino hosts one of the most ancient university in Italy. Placed on a spur on the Appennini Mountains at 670 meters high on the sea-level, Camerino achieves its period of greatest splendour under the rule of the Da Varano family. From the top of its rock it dominates the large valleys of the rivers Chienti and Potenza underneath, occupied by towers and fortresses. But if the town might look austere, the countryside, instead, is colourful and offers a lot of farms holidays where to spend a weekend. Download the free flash player!